What Will The Great Game of Business Do for Your Company? What The Great Game of Business offers is a new way of doing business. While it is a novel idea to many, the open-book approach to operating a business was pioneered in 1983 (and later formalized as The Great Game of Business). It was developed as a creative solution to saving a failing company, and the result of the experiment was dramatic. 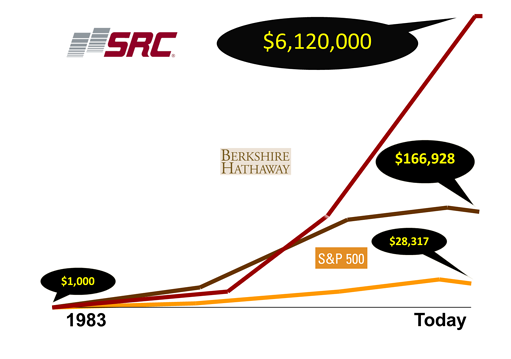 Using the open-book methodology, SRC Holdings Corporation in Springfield, Missouri, made a complete turnaround, producing $600 million in annual sales and increasing share value from 10 cents to over $612. In the process, it established itself as one of the most competitive companies in its industry. The Great Game of Business was formed out of this experience and is now used successfully to share these insights with other companies, whether they are looking to overcome challenges, accelerate growth, or just improve their organization’s culture by increasing employee engagement. Our experts in The Great Game of Business act as your partner and guide on the path to steady, sustainable growth for your organization. We do this by sharing our insights through learning resources, e-learning courses, free educational web content, and on-site training, conferences, and business coaching sessions. Through the years, The Great Game of Business has delivered results for everything from small mom-and-pop shops to high-profile companies, such as Southwest Airlines and New Belgium Brewing Company. Below is just a sampling of the positive outcomes we’ve collaborated with companies to produce. Every company’s situation is unique, but these results speak loudly about the ability of The Great Game of Business to help companies achieve outstanding improvement in their operations and revenue.